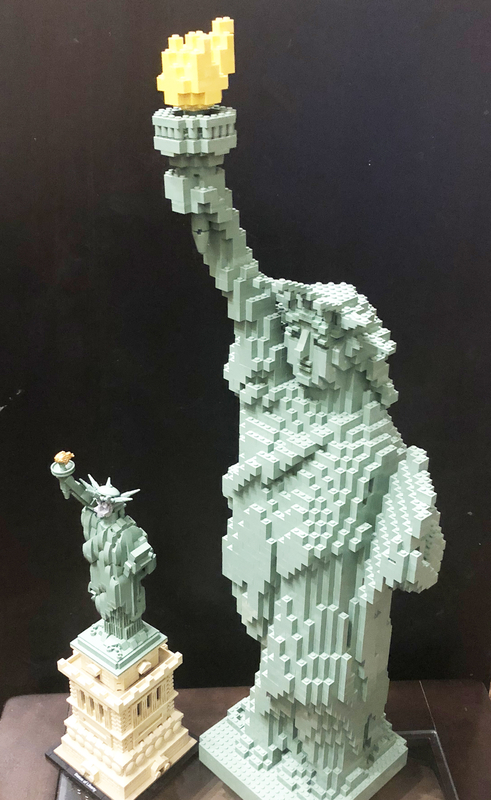 For anyone interested, here's a size comparison between the new Architecture #21042 and old Sculptures #3450 Statue of Liberty sets. 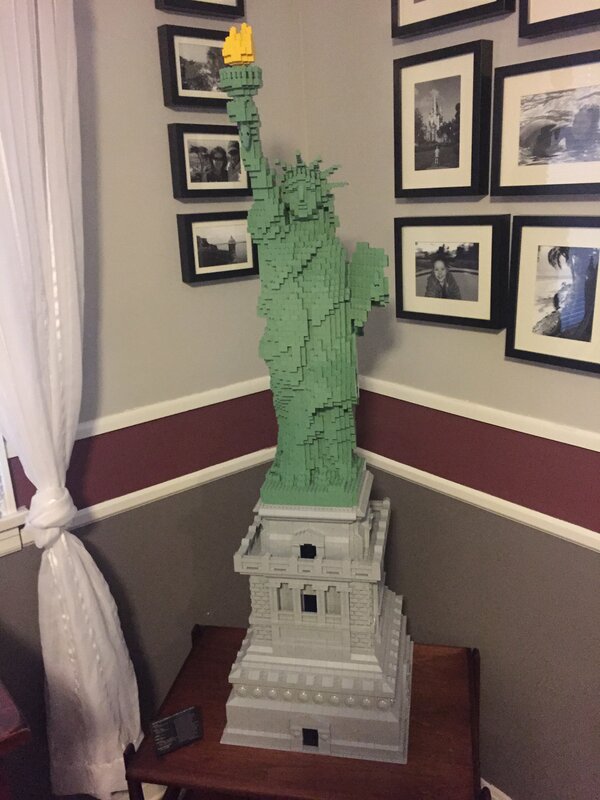 I was hoping that 21042 would be a bit taller considering its 1600 pieces. I like the design of the base, but I think the statue is slightly smaller scale, so the proportions are just a little off. By itself, 21042 is nice, but next to the big one, it looks pretty tiny. The 21042 build gets a little tedious doing the corners of the base, and the mix of parts 87087, 47905, and 26604 all in sand green (and multiple times in the same build step) was tough. 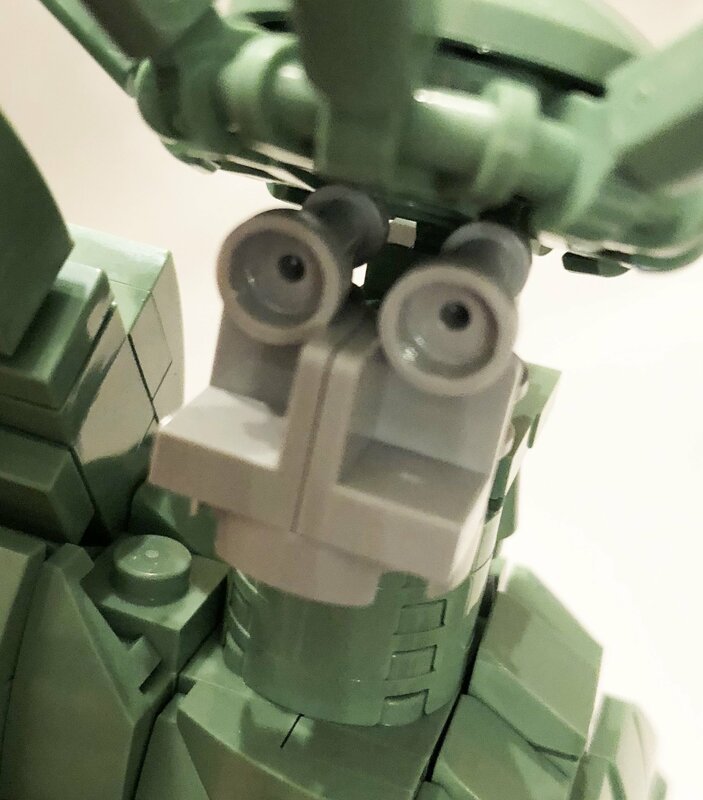 What you've done with the "face" is far better than what Lego has done to it. 28220 in sand green would have been much better. Not perfect, but better. Another pic of 3450 with Cameron Bethel's amazing 6700+ piece custom base (formerly my set, now resides somewhere in Singapore). l hope the big one gets a re-release like the taj mahal. 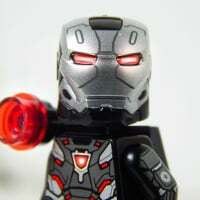 OP can you post a closer picture of the custom face on the small one? @leetshoe this version is too cartoonish but I haven't figured out yet how to get the nose to stick out 1/2 plate. The dimensions are 2 studs wide, or 5 plates on edge wide. The 5 plates should allow for a center element to protrude, but getting the protrusion and a stud reversal in the same small area has me stumped at the moment. Yeah, its a difficult one. I have to admit that at first sight I thought it looked like Jar Jar!!! I wasn't aware this set was a UCS! Honestly, I couldn't be more disappointed with the Statue of Liberty. The base looks great, but I don't like how it's the majority of the build. 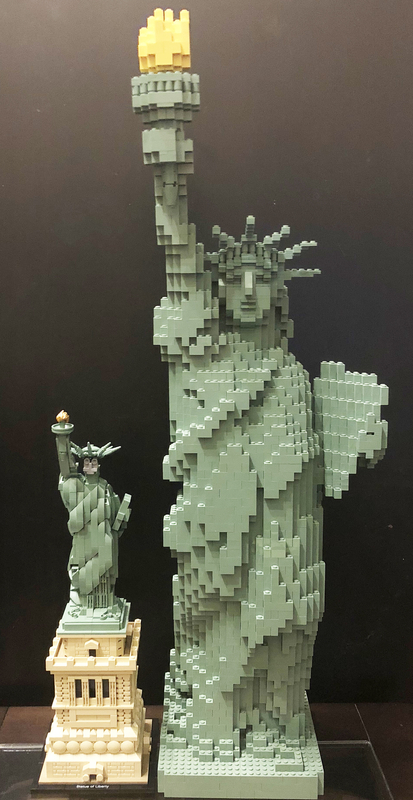 I'm sure it's not the designer's fault because it would be hard to include the base and an appropriate amount of bricks to detail the statue. This is a case where I will still be much more interested in getting the original. I'm sort of glad I don't like it because I won't be spending any unnecessary cash on it. I don't own the set but I'm guessing it's deliberately a scale they haven't really done before in order to add something more than a remake to the line-up. This isn't like Star Wars where we expect to see a new batch of fans every few years - it's a line for adults where people are far more prepared to go through Bricklink etc. to get retired sets. You're not going to randomly walk into a store, see this on the shelf for the first time and impulse-buy it. 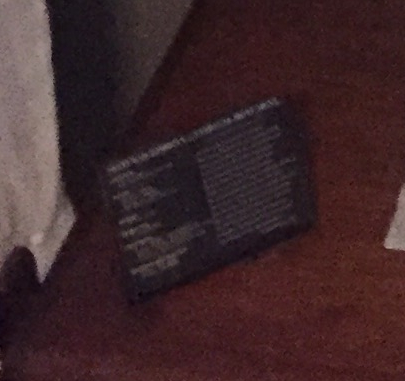 The custom UCS plate came courtesy of Cameron along with his custom base. How do you verify that a built #3450 is complete. Any particular parts to look at? Any particular section to take apart? No box or original instructions are available. 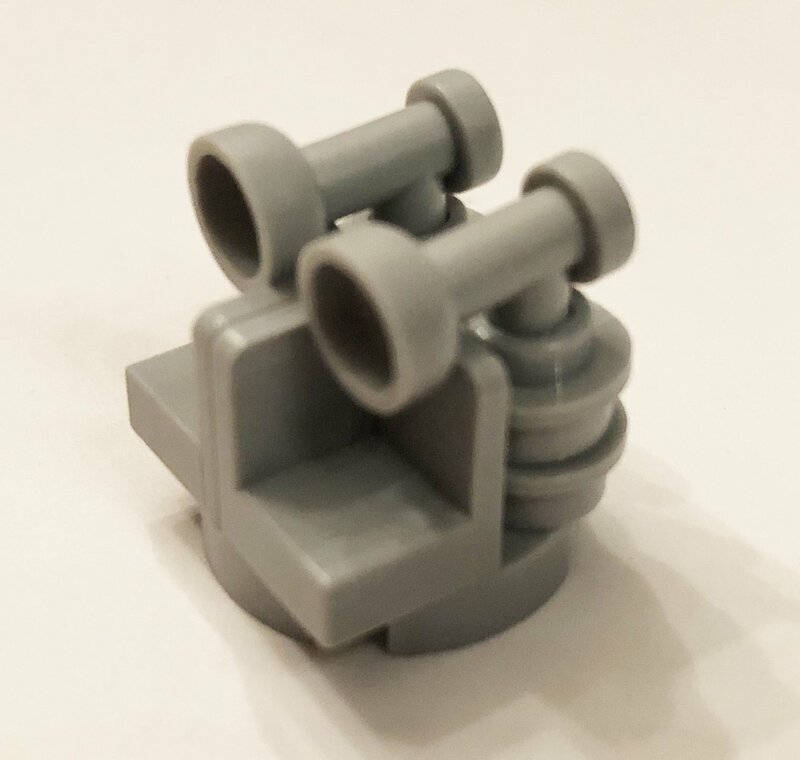 Original instructions are there on the Brickset page for it #3450. I believe I wasn't clear, I meant that what is being offered is without original instructions hence could be bricklinked with potential substitutes. In this case, how can I quickly verify that it is substantially complete and the most important pieces are present? Let's state the obvious here and say all pieces except the torch and baseplate are sand green. The macaroni bricks are the big deal here I think. Cheapest on BL are 25.00 EACH and there are 4 in this set. The next would be the sg 2 x 6 bricks. There are 191 and cost a buck each. Thanks. That's a big help. I can find where these are based on instructions and check for them (4 curved and a bunch of 2x6s). The sand green macaroni was reintroduced with the new Mac mold a year or two ago in Elves. So if you care a lot about 100% authentic you will want the old style macaroni without the extra lines of plastic support underneath.